arrived on time and works great ???? Battery seems ok but you never nearly know until a year or more is up! Great service from Tayna as usual. fast delivery, well packed and a good price. 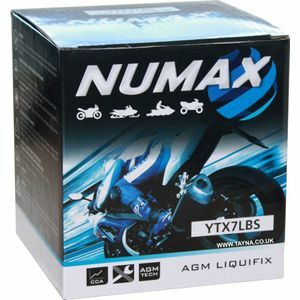 Delivery was quick, filling was very straight forward and the bike which had sat for about 4 years started without any problems. Had no problems with starting or running the bike, but it's early days. At this moment in time I would buy other batteries from Tanya and recommend them anyone looking to purchase a battery for their bike. Excellent service. Speedy delivery. Job done. Excellent service and an excellent product. Would fully recommend. Fitted retro battery case with foam padding. Terminals could be more user friendly. A great service and a good price. I have used Tayna a few times now and they are.a great supplier. Strong battery,perfect replacement very fast delivery. Can only be 5 stars. A great product at a very competitive price, easy to follow instructions and backed up by very rapid delivery with full tracking. I will use again without hesitation and can thoroughly reccomend.